(CelebrityAccess MediaWire) –The latest One Night Only big screen event is its first concert double feature with YES and Meat Loaf at 29 select Regal Entertainment Group theatres on September 27 at 7:30 PM local time. This exclusive in-theatre event, featuring the premiere of the live concert films YES: 35th Anniversary Concert -Songs From Tsongas and Meat Loaf Live With The Melbourne Symphony Orchestra, is presented by Regal CineMedia entertainment services, AEG Live and AEG TV. Advance tickets cost $12.50; Event day tickets cost $15. 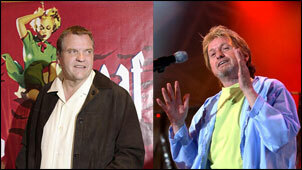 There will be a 10 minute intermission between acts, with Meat Loaf up first and YES closing the night. Filmed in May 2004 in Massachusetts, YES: 35th Anniversary Concert – Songs From Tsongas features the classic YES line up of Jon Anderson, Steve Howe, Chris Squire, Rick Wakeman and Alan White. It boasted a brand new stage design by long time YES collaborator Roger Dean, The YES: Songs From Tsongas 35th Anniversary Concert DVD from Image Entertainment will be available in stores on December 7th.